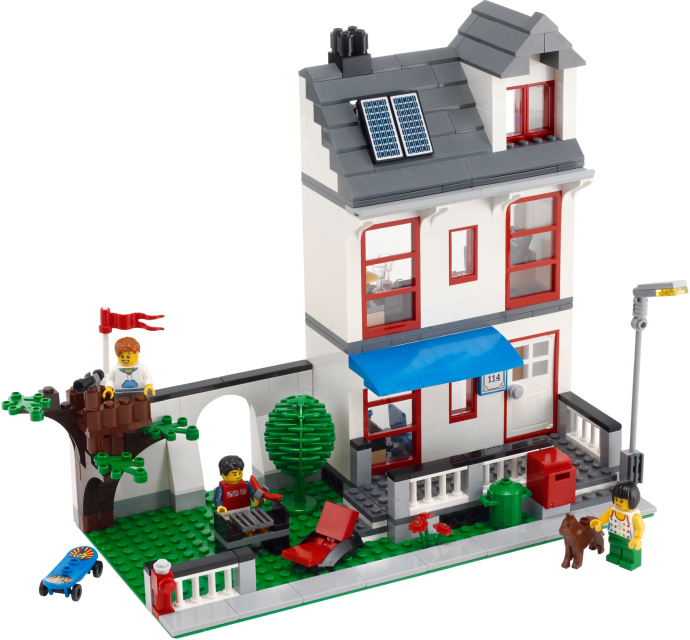 Eurobrick Member Lorentzen (also know as Blackbeard on Bricklink) has written a brilliant article looking the "Classic" Town Houses LEGO has released over the years. Kindly I have been given permission to include it on my blog, so read on and enjoy. If anyone is interested in looking at the Orignal work (which is PDF formatted and looks a bit nicer than my below adaptation) just click on the Link. Way back when, in 1978, something marvellous happened in the world of LEGO; the classic LEGO theme "Town" and the beloved "minifig", as we know it, were both introduced. Set no. 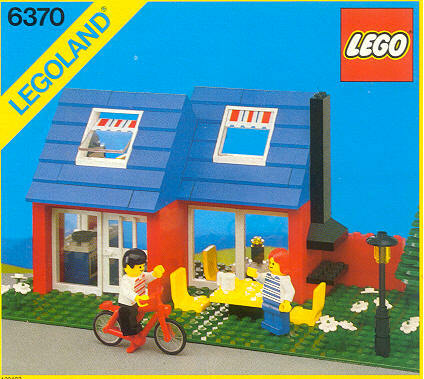 376 was the first LEGO house that was intended to house minifigs. Prior to 1978 a few houses had already been introduced with one of the first being set no. 324 from 1965 called "House with Garage". 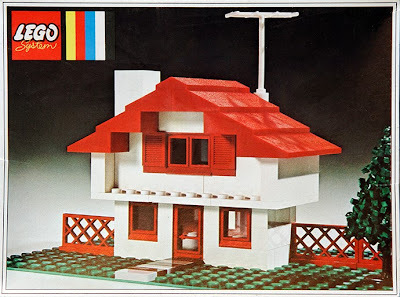 Because the minifig, as we know it, was not introduced until 1978, when LEGO Town made its appearance, all houses prior to "House with Garden" can thus be seen as models of houses, whereas this classic house is the first minifig-suitable house. Set no. 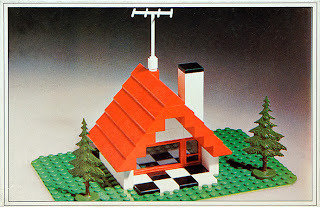 324 House with Garage from 1965 was perhaps the first house released by LEGO. As we can see, this size does not allow minifigs to live inside, but this was due to the fact, that the first version of the minifig was not introduced until 1974, and in 1978 the minifig as we know it, was introduced along with the new Town theme. 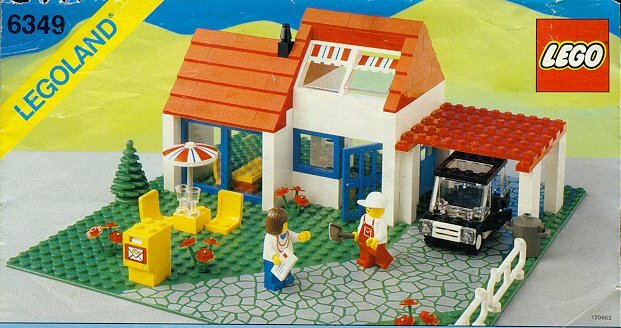 In 2010 the LEGO Group released a set that made us remember the sweet 1980's yet again - namely set 8403 City House. This was the first house of its kind in 15 years, and the second of its kind since 1990. 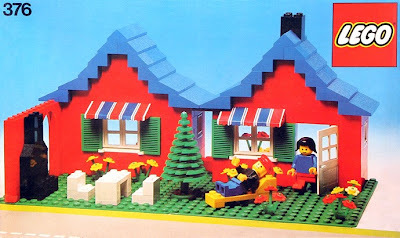 Prior to 2010 though, The LEGO Group had released all other kinds of house-sets, such as the wonderful Modular house-series and the many Creator houses, but none like this City House: A regular town house intended to live in full time. The new house, along with the recently released 5766 Log Cabin under the creator theme may indicate the return of the Town house which we remember from the 1980's. 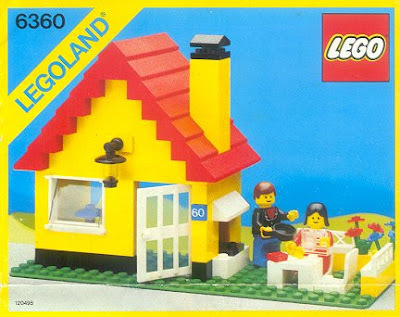 After 1965 a handful of houses were released, but none of them could properly house minifigs. Instead, they were models of houses from various countries. The three examples below were released in 1971 - prior to the release of the first edition of the minifig in 1974. 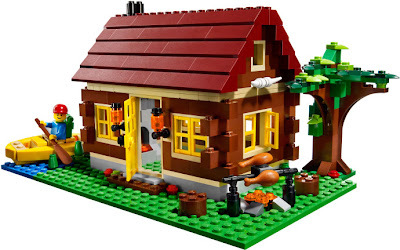 This article will present a chronological run-down of the various LEGO houses that have been released throughout the years, and I will discuss various features and thoughts below each of the houses. 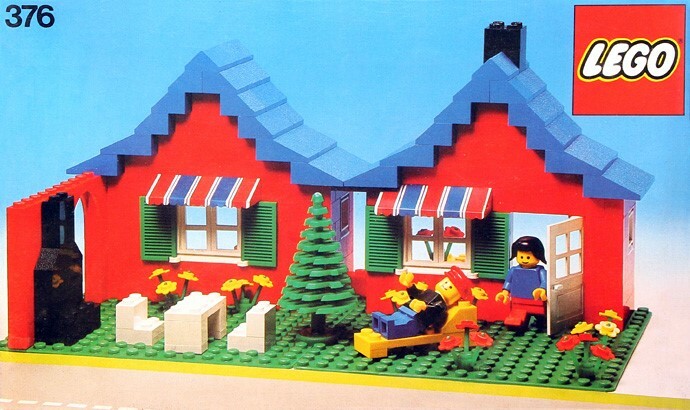 This article honours what we know as the classic LEGO house. The LEGO Group released several houses throughout time, but not all of them will be discussed here. Instead I will focus my attention on those that have been released in the classic "Town" (Now called City). By doing so, we will be able to witness the design structure of LEGO SYSTEM from the early 1980's until today, early 2011. Even though the Creator houses and Modular houses are intended to house minifigs, they cannot be categorized as "classic" and their design structure separates them from the houses of LEGO Town/City. Although the Modular houses released between 2007 and until 2010, including Green Grocer, Market Street and the likes, are all released under Town theme, they are not intended as regular play sets, which makes them fall out of the "classic" category. Their price indicates that they do not belong in what we recognize as a play-theme; sets which should be affordable to the majority of customers. The six examples of houses below all fall out of the "classic" category. This house is one of many from the theme Minitalia from 1971, 1973 and 1796. This is set no. 0005-4 (originally 5). 6379 - Riding Stable (1986) although a house, it is not intended to be lived or slept in. 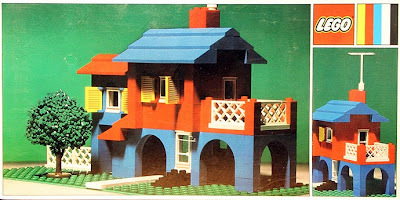 Below all the classic LEGO Houses will be presented and commented on. 1978: Set no. 376, House with Garden. This was the very first LEGO house that was intended to house the newly designed minifigs. As we can see on the picture, it looks as though the house is two houses next to each other, but it’s actually because you can fold the house out via hinges on the house. The two happy minfigs can enjoy their cosy garden, practically secluded from the busy streets of LEGO Town. Out here they can sunbath or sit and relax in front of their outdoor fireplace. Inside they can watch TV on their small television or sit at the dinner table in the small kitchen where they can wash up by the neat sink. All in all this first Classic LEGO house is a wonderful part of the, at the time, newly established LEGO Town. This very first house can of course be found on various internet sites, which deal with used LEGO. The price for a used complete set (with original stickers) is on Bricklink.com for sale for around 120 dollars. There is currently (April 2011) a mint sealed set for sale at 800 dollars (that’s the slightly newer 1979 version of the set 560). 1981: Set no. 6365, Summer Cottage. 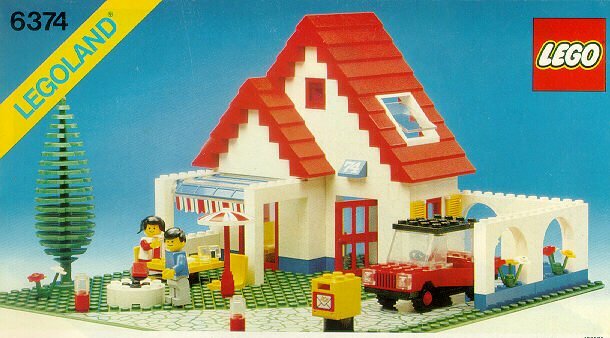 After two years with no new houses, this set came out in 1981 to reach the rising demands for private housing in LEGO Town. Although a "Summer Cottage" and thus more suitable for placement in the vicinity of a town, this house could easily fit into the existing design of the rest of the buildings in LEGO Town. Only one minifig came with this set. Apparently she wanted all the peace and quiet that only a vacation for one could offer. Notice that she has a nice printed torso considering it was 1981. This set has a nice red and white sunshade and chair/table set. Inside there is a small kitchen with an oven, a refrigerator and a cupboard. Next to the kitchen the resident can take a nap on the comfortable bed, or read a book by the lamp. This set is rather small, but summer cottages are usually smaller than regular homes. If you wish to buy this set used with original stickers, you could end up paying more than 85 dollars on bricklink. A mint set would cost you 850 dollars. 1982: Set no. 6372, Town House. This set is a small step up from the previous two sets, and has slightly better details all around, in addition to the minifigs that also look slightly more detailed. The playability of this set is very similar to set no. 376/560, especially with an outdoor fireplace and furniture in the garden. Notice the nice yellow mail box, the wonderfully striped awning/sunshade and the windows in the red roof. The design structure is indeed very classic and adds a feeling of cosiness to the general picture of life in LEGO Town. The two minifigs from this set look a bit more detailed than their neighbours who moved into LEGO Town in 1978. The price range for this set in used complete condition with original stickers seems to be around 90 dollars. The stickers for sets this old are rare and expensive indeed. A completely new set costs around 320 dollars these days. These prices are found on bricklink. 1983: Set no. 6374, Holiday Home. Now we are really getting somewhere. This house is one of the best of the bunch. The sliding patio roof is an excellent detail, and the technique is still used in LEGO sets today. This detail and the small car screams "1980's" LEGO design. Furthermore, the house has an extra floor, a cobblestone driveway and a wonderful garden. Inside our minifig-couple can make dinner in their (at the time) very modern yellow kitchen, or they can relax in the yellow furnished living room, before going to sleep in their yellow king-sized bed. This set is definitely one that the designer should be very proud of, and it is still popular among LEGO enthusiasts today. The price for a used set with all the original stickers has an average of 120 dollars on bricklink. A new and sealed set could cost you up to 800 dollars. 1985: Set no. 6370, Weekend Home. A full year passed (1985) without a regular classic LEGO house being released. The Weekend Home is a modern update of the original set 376 House with Garden. The house is split into two smaller buildings, and is in general not that large. But it is definitely a nice addition to the ever growing neighbourhood of LEGO Town. 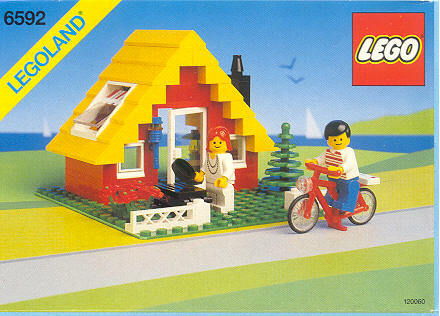 In this set, the minifigs have a red bicycle, but they also have the opportunity to enjoy themselves in their garden, where we once again see an out-door fireplace. This must really have been modern back in the 1980's. The blue roof has two large windows with classic red, blue and white striped curtains. This nice little set costs between 120 - 150 dollars in used complete condition, and all the way up to 475 dollars for a new sealed set on bricklink. 1986: Set no. 6360, Weekend Cottage. At this point, after the release of 6 houses, only once did a set include a single minifig. This set has two, which is only fair because the actual house is very small, and not as inspiring as some of the earlier houses of this line. 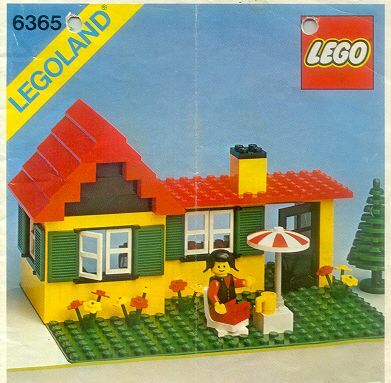 You would think that at this point in the history of LEGO Town, the houses had become bigger to suit the needs of the demanding minifigs, but this house was the smallest yet, counting only 113 pieces. To be fair, it is only a Weekend Cottage, and it actually does have some nice features, such as the well designed lamp above the front door, the roof window and the small outdoor fireplace. On bricklink this little set costs around 65 dollars in a used complete condition, while it is much more expensive in a sealed box: between 240 and 260 dollars. 1987: Set no. 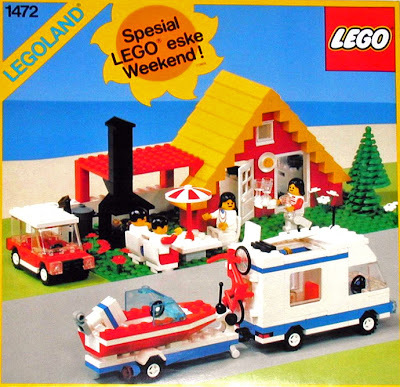 1472, Vacation House (limited release). On bricklink you will have to pay around 165 dollars for a used complete set with all the original stickers, while a sealed set costs around 350 dollars. 1987: Set no. 1484, Houses (Weetabix promotional release). 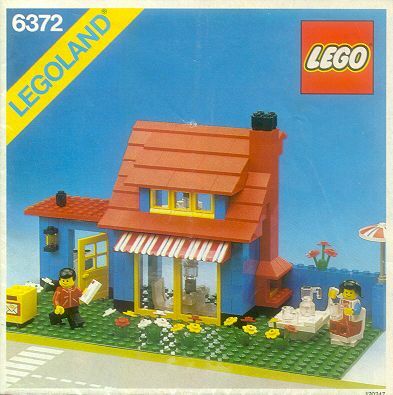 This set looks like a re-creation of the 1985 set 6370 Weekend Home. There are not many differences other than the fact that this set is supposed to be two houses, whereas the set from 1985 was one house. The houses fit in with the rest of the bunch in LEGO Town, and there is even a nice blue car in the cute classic Town design. The trash can, red fence and the roof windows are also highlights of this set. On bricklink this set costs around 100-130 dollars in used complete condition, while it could cost you up to 250 dollars for a sealed set. 1988: Set no. 6349, Hoilday Villa. Yet another true masterpiece. This set has similarities with set no. 6374, and is merely a modern update of the five year older set. That does not, however, mean that this does not merit a place among the greatest of them all. Look at it: The white fence, the garage, the beautiful black car, the curtains in the roof windows, the cobblestone driveway. All the details add to this set's greatness. 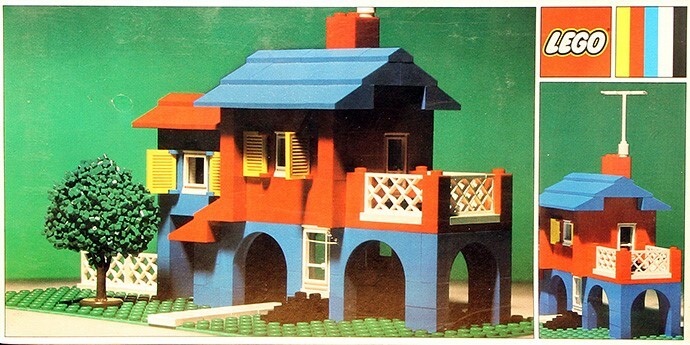 Unfortunately this set was also one of the last classic LEGO houses with only a few successors during the 1990's. This is also quite expensive to buy these days. The average price on bricklink for a complete set, with or without the box, is around 90 dollars. If you want a sealed set, you will have to pay up to 400 dollars. 1990: Set no. 6592, Vacation Hideaway. 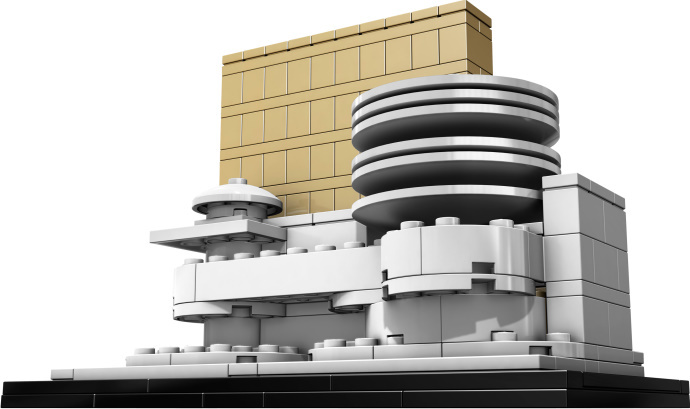 According to brickset's piece count this set is the smallest so far. 111 pieces is not a lot, and the small 16 x16 baseplate does not help in that respect either. But still, this house looks really nice, and it has the same design features as all the previous houses. The yellow roof was used for set 1472 Vacation House in 1987 and this set only, and it looks really nice. 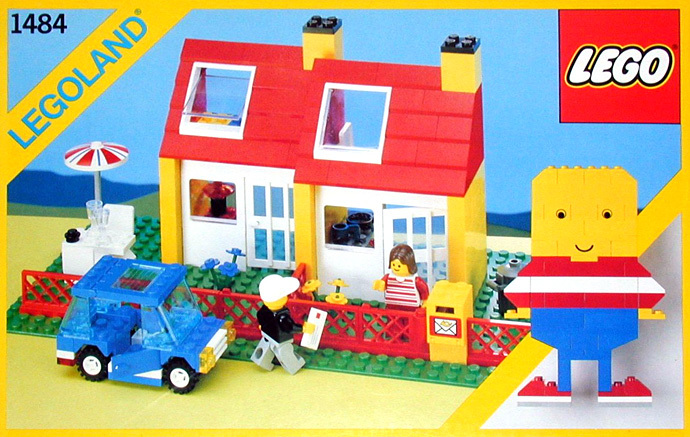 This set was the very last non-promotional classic LEGO house released. If you go to bricklink to buy this set, you will have to pay around 55 dollars for a used complete set, while a sealed set "only" costs around 110 dollars. 1996: Set no. 1854, House with Roof-Windows (Velux Promotional Release). The design structure of this house blends the classic features that we have seen in all the previous LEGO houses, together with the building style of many modern Danish houses of the 1990's. 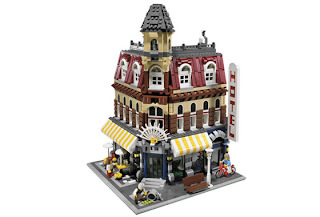 There are no used copies of this set on bricklink and there has not been any sold within the last six months. Instead, the cheapest sealed set costs 60 dollars. From 1978 to 1996 the LEGO Group released 11 classic LEGO houses that our beloved minifigs could live in full-time. They all have a certain design-structure, which includes large blue/red/yellow roofs with large windows. The roofs were never black. Many of the houses had an outdoor fireplace or something similar, and most of the houses had a set of chairs and a table in the garden. Only one set had a single minifig, while all the others had two minifigs, aside from set no. 1472, which had four. Besides from the above mentioned features, the classic LEGO house was built on a green baseplate and had an average of 195 bricks. 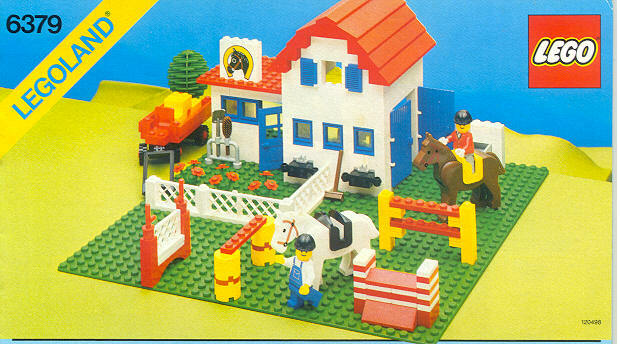 The sets in the classic LEGO house line were rather small and very affordable to the normal consumer. In 2010 we finally got a new LEGO house but does the house look like the old houses of the 1980's/1990's? No, not very much. It is a massive change of the "classic LEGO house". But let us see where it still resembles the 11 classic LEGO houses: It has the green baseplate and an outdoor grill, which is an update of the almost obligatory fireplace of the old sets. The back wall with the arch is another feature that we have seen in earlier sets. The large windows are also a well known design feature, but it ends there. The rest of the house adds many new ideas to a classic line of sets. This is not negative, but a natural move in the direction that the last five years' sets have moved. 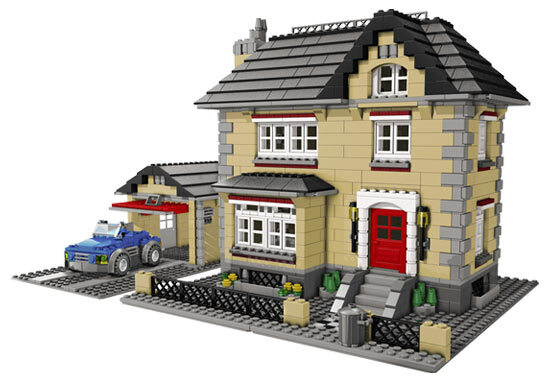 The new house fits well into the current design features of LEGO in the 2010's - time will tell whether or not the "neo classic" LEGO house will be a recurring part of the Town theme, or if it will be "the odd one out" .... 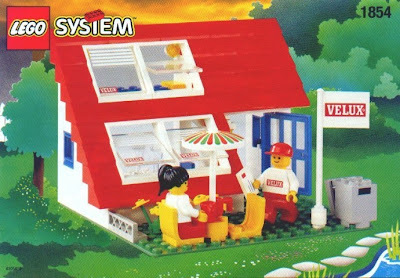 The 5766 Log Cabin from the creator line could very well be an indication that houses intended for minifigs are on the return. Dr. Suess apreaciates your good work young knight! Hey Steve! Set no. 6365, Summer Cottage. Can you give me any leads as to where I can get one? 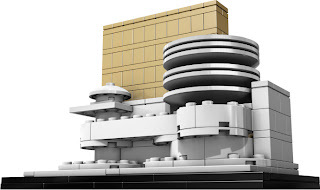 I like using the lego city lego blogs for my own ideas such as: cars, buildings and so on. Wow cool have u heard about the lego contest? u should enter!